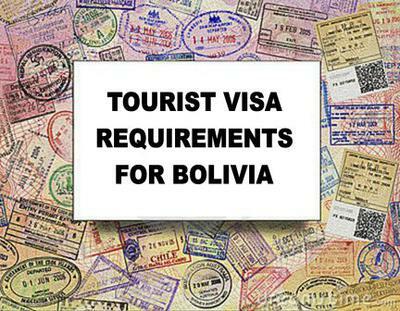 Requirements to Obtain a Bolivia Tourism Visa. This information on the requirements for obtaining a Bolivia tourist visa is from the official website of the Bolivia Immigration Service. Note: In all cases, immigration law applies to your passport country (the country of your citizenship or nationality). This means that even if you are entering Bolivia from another country, the Bolivia visa requirements that apply to you are those of your country of citizenship. Es otorgada por treinta (30) días calendario con el propósito de descanso o esparcimiento que no implique el ejercicio de actividad remunerada o lucrativa por cuenta propia o ajena; habilita a tramitar la permanencia transitoria por turismo o visita ante la Dirección General de Migración por dos (2) periodos similares. La estadía para turistas es de noventa (90) días calendario como máximo por año. The tourist visa is issued for thirty (30) calendar days for the purposes of rest or entertainment implying you may not carry out activities that are for profit or paid by yourself or someone else. The 30 days visa may be renewed up to two (2) times at the Bolivian Immigration Service for an additional 30 days each time. The maximum amount of time tourists may remain in Bolivia is ninety (90) calendar days per year. Fill out the Bolivia Tourist Visa Sworn Statement for Visa Application Download it here! 2. Pasaporte con una vigencia mínima de seis (6) meses vigente. Passport with a minimum of 6 months remaining on it before it expires. Vaccination certificate showing you've had a yellow fever shot, if you plan to visit areas where there is high risk of contracting it. Travel itinerary OR round trip ticket OR letter of invitation from a person legally domiciled in Bolivia (registered and authorized by the DIGEMIG) OR hotel reservations. Proof of economic solvency accredited in writing and backed by a sworn statement. Current photograph (4 x 4 centimeters with a red background). 7. Constancia de pago del costo del trámite correspondiente (requisite presentado por la o el usuario en la etapa de registro de trámite). Proof you've paid for the corresponding visa application (this requirement will be presented by the user while applying for the visa). *Todos los documentos emitidos por el país de origen o de su última residencia en otro idioma diferente al español deberán ser traducidos y debidamente legalizados. *All documents issued by the country of origin, or in your country of most recent residency, in any language other than Spanish must be translated and duly legalized. To translate this text into any other language, copy and paste the text above to www.translate.google.com. Group 1 is a list of countries whose citizens do not need a tourist visa to enter Bolivia as tourists. Group 2 is a list of countries whose citizens DO need a tourist visa, but will be issued one upon arrival. Group 3 is a list of countries whose citizens DO need a tourist visa AND must obtain it prior to traveling to Bolivia, by visiting a Bolivian consulate in your country of origin. (Please be aware that the above named Bolivian government websites are not always updated immediately when laws change. It is still best to contact a Bolivian consulate to obtain the latest information regarding visas for citizens of your country, prior to traveling to Bolivia. If there is no Bolivian consulate in your country, contact the Bolivian consulate in the country nearest to you.) Click here to find a Bolivian consulate. Click on Servicios al Ciudadano then click on Consulados.